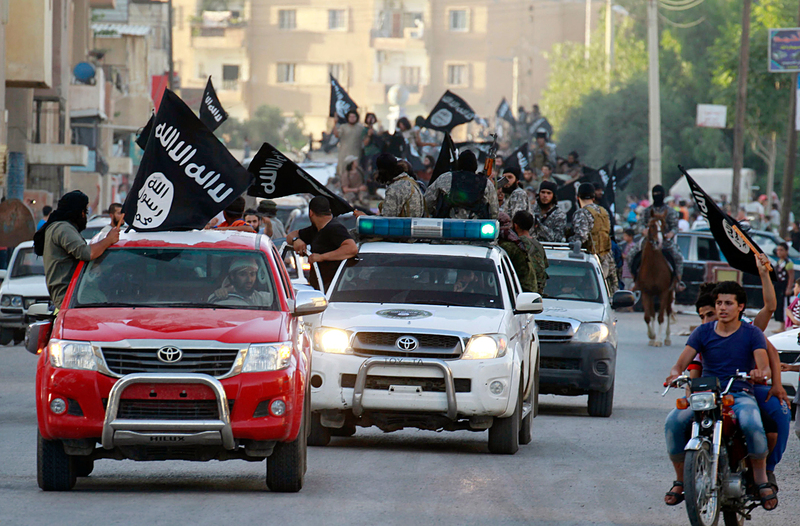 Militant Islamist fighters waving flags, travel in vehicles as they take part in a military parade along the streets of Syria's northern Raqqa province June 30, 2014. The new threats emanating from Islamic terrorists against Russia can be attributed to the defeats they are suffering in Syria, Russian analysts believe. The threat of terrorist attacks remains very real. Islamic State (ISIS) terrorists posted a new video on YouTube on Sunday July 31 in which a man, his face covered, says into the camera: “Putin, can you hear? We’ll come to Russia too and we’ll kill you there too, inshallah.” He then calls on Islamist terrorists to launch a jihad against Russia. According to Reuters, the link to the video was posted by a Telegram account linked to the militants. Islamic State has decided to call on its supporters to launch a jihad against Russia because Russian Air Force operations in Syria is doing serious damage to the radical group, said Vladimir Akhmedov, Arabic scholar and senior researcher with the Institute of Oriental Studies at the Russian Academy of Sciences. “ISIS has been seriously battered. According to various estimates, it has lost from 30 to 50 percent of the territory it had in Syria,” he said. Sergei Goncharov, president of the international association of veterans of the Russian counter-terrorist unit Alpha Group, agrees. He links the threats against Russia to the wave of terrorist attacks that has recently swept across Western countries. “Suffering defeats, ISIS is trying to move its terrorist activity outside Syria. This creates a threat for European countries, the U.S. and possibly Russia too,” he said. So far, ISIS has not carried out any major acts of terrorism on Russian soil. Its biggest attack was the explosion aboard the Russian Metrojet passenger aircraft above the Sinai Peninsula on Oct. 31, 2015 (which claimed 224 lives). Nevertheless, experts caution that the terrorist threat should be treated with utmost seriousness. “There are between 2,000 and 4,000 Russian nationals fighting in ISIS ranks, mostly Chechens and representatives of other North Caucasus republics,” said Akhmedov. As the group is suffering military defeats in Syria and Iraq, it is very likely that these radicalised militants will be returning to Russia to carry out attacks there, he said. Russia, however, is less susceptible to the terrorist threat than Europe, believes Goncharov. “European countries are flooded with refugees and migrants, including sleeper ISIS agents, who may become active at any moment. This is not the case with Russia,” he said. How is Russia tackling the threat? Experts believe that Russian special services are coping with the threat overall and are capable of preventing militants from returning to Russia. “Our borders are under control. Agents in the field have a lot of data about those terrorists and mercenaries who are fighting in Syria,” said Goncharov. On July 27, four days before the threatening video was posted, Federal Security Service (FSB) director Alexander Bortnikov told the TASS news agency that his department was carrying out systemic work aimed at preventing terrorist attacks. “The number of potential pseudo-suicide bombers under operational control currently exceeds 220 people,” he said. The next day Bortnikov said that the FSB was cooperating with foreign secret services, including those in the U.S., as part of the fight against international terrorism. Russian observers are convinced that despite the ISIS threats, the operation in Syria should be continued as, according to them, it is the only way to defeat the group and to prevent further terrorist attacks. “It is important not only to beat ISIS but also to strip it of its social base,” said Akhmedov, who believes that if the terrorist group loses territory and support in Syria, its popularity will start to wane.